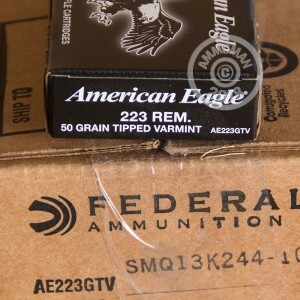 This 223 Rem cartridge from Federal’s American Eagle brand of ammunition sports a 50 grain projectile. The bullet features a polymer tip which not only streamlines its shape for optimized aerodynamics, but also helps to initiate expansion upon impact when it is driven deep down into its core. This bullet also has a boat tail design, the tapered base of which drastically reduces drag to give it a higher ballistic coefficient and accordingly lower sensitivity to crosswinds, a flatter trajectory, and higher energy delivery to the target. 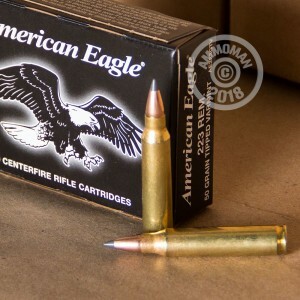 Along with this round’s extremely fast 3,350 fps muzzle velocity, you’ll have everything you need to turn gophers inside out from great distances. IT is fine for training and target practice as well. 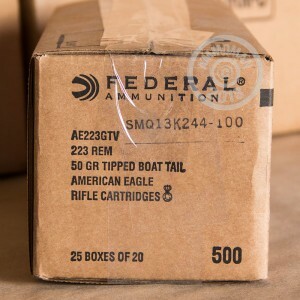 This cartridge additionally features a non-corrosive Boxer primed factory fresh brass casing, making it the perfect stuff for work at the reloading bench. The thorough visual inspection it has passed means that it will perform well in practically every temperature America can throw at you, among other things, and its primer sealant guards it against moisture contamination.